2. Portraits are of one child only. Each sibling must have a separate session. 3. Portrait sessions include one outfit and one scene only. Portraits will be created in or outside the Artistic Images Studio. 4. Portrait sessions will be created during normal business hours and are not available on Saturdays or Sundays. 5. Elizabeth will decide how the child will be photographed after a brief phone consultation with the contestant's parent. 6. Session is complimentary and includes one image submission to the competition. 7. Elizabeth will choose which image is submitted to the competition. 8. 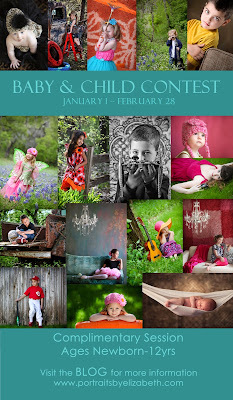 Submitted images will also be put on Facebook and E-Blog for online competition and voting. 10. Child must be between age newborn to 12 years of age. 11. Voting ends March 28, 2011 and the winners of the Artistic Images contest will be announced immediately following. The National Competition will not be finalized until July 2011 and we will notify you if you are a finalist as soon as we know. All cash prizes are given to the child's family. The photographer's work will be published but will receive no monetary compensation. 2. Entering your child into the Artistic Images Baby and Child Portrait Contest will enter them into an online competition hosted by Artistic Images. 2. Only a select number of "contest sessions" will be photographed so call NOW to get on the calendar before it fills. What if I want to purchase some? Of course you can purchase whatever you wish off of our Collector's Series Price List. Images may be shown immediately following your portrait session (by appointment only) or can be put online for you and your family to view and order from home. Images only remain online until April 12 so please make any selections during that time, as re-uploading them will incur a $50 fee. The more friends, acquaintances, coworkers, etc that you know the more votes you will get! PLUS...the fact that Artistic Images already has a lot of fans and Elizabeth has a lot of friends, people that you don't even know will also vote for your child's image. PS: Elizabeth has won more awards than most so with your child in her hands....Your chances to win something are AMAZING! And if you win nothing at all, you have had some beautiful portraits of YOUR Child that you will cherish FOREVER! It is hard to believe but it is only 11 days until Christmas! I feel pretty prepared...Christmas shopping DONE, Christmas cards are in but not addressed...but I am still not ready for the day to come, yet! For Christmas this year, all three Homan boys are getting a TRIP to DISNEYWORLD! Shhh, if you see them before Christmas, it is a surprise and they will open up a big box on Christmas morning stocked full of Disney paraphernalia. We leave Christmas night for a 7 day family vacation to the magical place. We are so excited!! So what is happening at the studio? We will be CLOSED beginning Christmas Eve and will reopen on Tuesday January 4th. All of the staff has been working overtime and will enjoy a well deserved break. upcoming portrait sessions in 2011! Keep your eye on your email inbox and your regular mailbox for all of the special events that are happening in January and February as well as some new Destination Portrait Adventures we have planned. If you are not on our email list please email us at info@portraitsbyelizabeth.com. Emails are never shared with others and we promise not to clutter up your inbox! Wow! The Christmas season has been a busy one for us. Between all of our Christmas Collector's Series events, Home for the Holidays events at the Missions, Weddings and regular portrait sessions (including hiking 10.6 miles at Lost Maples State Natural Area) there has been no time to update my blog! With all of these sessions under my belt, the next step is editing and getting them prepared for you, the client, to see. I did a rough estimate and not including the Christmas Collector's Events from Nov.19-28 I took about 7800 images! That includes two weddings in one weekend, 16 family portrait sessions and 2 high school seniors. Now let me tell you, I am not getting any younger. This spending hours and hours staring and concentrating at the computer screen has NOT been a good thing for my poor eyes. I have always had great vision, but this year I hit the magic number that caused my eyesight to start failing me. Thank goodness for those auto focus cameras!! So off I went to my trusty eye doctor (Dr. Diana Gonzales at Vision Source) for her to share with me the bad news. How bad was it?? Honestly, not too bad. It turns out I just need a stronger prescription for my reading glasses while I am on the computer. I am hoping that this helps take the eye strain away and I can continue my quest to finish the work that still lays ahead of me. In the midst of all of this, some lovely person has decided to hack my Artistic Images Facebook Page and send out free iphone/ipad links every few hours to all of my fans. Sweet! What is in it for them??? Who knows! I have changed passwords and emails 3 times to no avail so have had to close it until time allows me to start all over again! Bummer. I still have my personal account under the name Elizabeth Cruger Homan if you would like to "friend" me, I will accept. I am sending updates regularly and I do some special things that are only good for my Facebook Friends. All in all, the Holiday season has been a fabulous one! I am blessed to continue to do what I love and love what I do!